Home » Rose Water & Orange Blossoms Blog – Fresh and Classic Lebanese Recipes » Stories and Recipes » Christmas » Lebanese Baklawa Recipe. Do you hear what I hear? My Lebanese baklawa recipe gives you step-by-step instructions so you can enjoy baking and eating this beautiful classic pastry. Lebanese baklawa is buttery, crisp layers of phyllo filled with nuts and drenched in flower water syrup. Once you get the hang of the many parts involved, it’s a wonderful and not-difficult addition to your baking repertoire! Read my full guide here.By the way, you don’t have to butter every layer! Watch my video with a very simple method here. The role baklawa plays in the repertoire of the Lebanese home cook is formidable. Most every Lebanese woman of my parents’ generation makes her baklawa for special occasions, especially Christmas. We swoon over baklawa to such a degree that it’s like our little pet, our little coosa. We call it our baklawi (bit-LAY-wee), just like you might call me Maureenie, or my sister Pegsie, or your mother Mommy. The pastry must have become so endearing not only because of its crisp, buttery layers that incite near-delirium when eaten warm from the oven, but also because of the labor required to make baklawi. 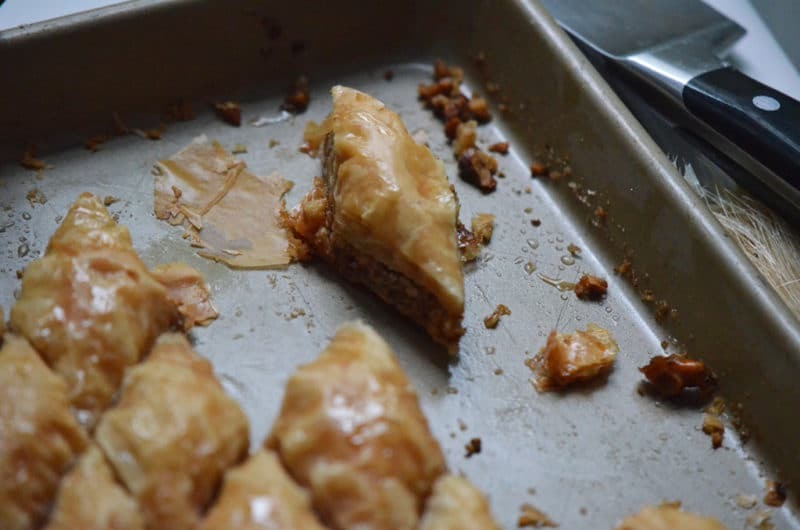 There are several steps involved—clarifying butter, making and cooling orange blossom simple syrup, chopping and sugaring nuts—and these no doubt would pale in comparison to the work that once was the burden of Middle Eastern women the world over: the making of the phyllo. Seems they had to stretch the dough as thinly as possible by pulling it across the kitchen table in one huge sheet. I imagine these l­­­ittle ladies danced a jig in their house dresses on that same tabletop when they discovered commercially-made phyllo. It’s a wonder that certain tasks like stretching phyllo didn’t just fall by the wayside, but they did it as though there was no option, and their success in their labor no doubt pushed them full steam ahead. Aunt Hilda made huge platters of baklawa all wrapped up like the present that they were, each piece encased in its own pleated foil cup and the whole thing wrapped up with pink Saran and topped with a bow. This baklawi-gift was personally delivered to the homes of Hilda’s brothers every Christmas. It didn’t matter to her, or to us, that we had our own huge tray of baklawa that my mother made (“your mom browns hers much more than I do, and there’s nothing wrong with that…”). The more baklawa, the better. Hilda labored over the baklawi in her kitchen, over the phone, out for lunch or dinner or anywhere good conversation was had. She felt hers was truly the best. Her pastry looked like the traditional diamond-shaped pieces but it was actually made with long logs of phyllo and nuts that had been rolled up and placed snugly next to one another on the tray, and then cut into diamonds. She learned this method from Aunt Louise, and now many of the cousins, having learned from Aunt Hilda, make theirs this way too. The pieces hold together nicely. Aunt Rita has baked enough baklawi to earn her a place in the baklawa hall of fame. No doubt she too feels hers is truly the best. For years, her kitchen would turn into a bakery at Christmastime as she made tray after tray, some 50 of them every December. The effort required 20 pounds of clarified butter and 50 pounds of phyllo from wholesalers. Whenever she saw butter or sugar on sale, she bought it. She sold the trays for $25 each. Today, she says, she wouldn’t do it for less than $50. But carpel tunnel has gotten to her hands and it just doesn’t work anymore. How did this happen, she says with a sigh. You can imagine that anyone who makes that much baklawa comes up with some tricks of the trade. The practice of buttering each layer of phyllo can be Zen-like and all peaceful and everything if you are making one. But get up to 50 trays, and mind is going to prevail over matter. Rita’s mind went to what might happen if she didn’t butter each layer, if in fact she just laid the 20 leaves of phyllo right into the pan, scattered the nuts over that, laid 20 more leaves on top—then cut it into diamonds and poured all of the butter over the whole kit’n kaboodle, letting it seep down through all of the layers and nuts. What happened was this: the baklawa was just as delicious as if she had buttered every layer. My mom took up this practice, which means I took up this practice too. I’ve taken to bragging about how you don’t have to butter every layer and even taught my classmates at Tante Marie’s Cooking School how to do it. They were shocked; I took a bow. Then I went to make the baklawa for you the other day. I whipped it out fast. Mom helped and we were pleased with ourselves for making a beautiful baklawi for the blog. Then we tasted it. Wet. Soggy. And so floral with orange blossom water that one bite was about all any of us could take. But I KNOW this method works!, I said. It does, she said. We just made six trays this way for Aunt Hilda’s funeral luncheon not six months ago which were, we thought, worthy of the occasion. So we made the baklawi again and used less of everything—clarified butter, nuts, syrup, and especially mazaher. I called Aunt Rita to chat it up about her baklawa. She talked about how much she misses Aunt Hilda, and that you don’t have to panic if it looks like you have too much liquid. Just stay calm, and pour it off. All of this fuss over the baklawi is worth it; you will understand this if and when you make or have some of the good stuff. Commercially-made baklawa tastes as though it’s made not with butter, but with oil, and it simply can’t compare. The homemade pleasure starts when the pan has been in the oven for about 15 minutes, and the intoxicating scent of butter and pastry begins to swirl about the kitchen and throughout the house. There is Gloria in Excelsis Deo when the cool orange blossom syrup is poured over the hot pastry, giving you the most satisfying sizzling sound effect. Once the baklawa is cool enough to handle, cut off one of the ends that aren’t pretty and eat it. It might be too hot still and you’ll burn your mouth, like I did yesterday. But that won’t phase you. You’ll keep eating the crispy, toasty morsel with your eyes closed. The baklawi isn’t so different from all our little coosas: you’ll produce something special with a little TLC, a lot of parent-pride, and the faith that your baklawi will go out into the world bringing goodness and light. 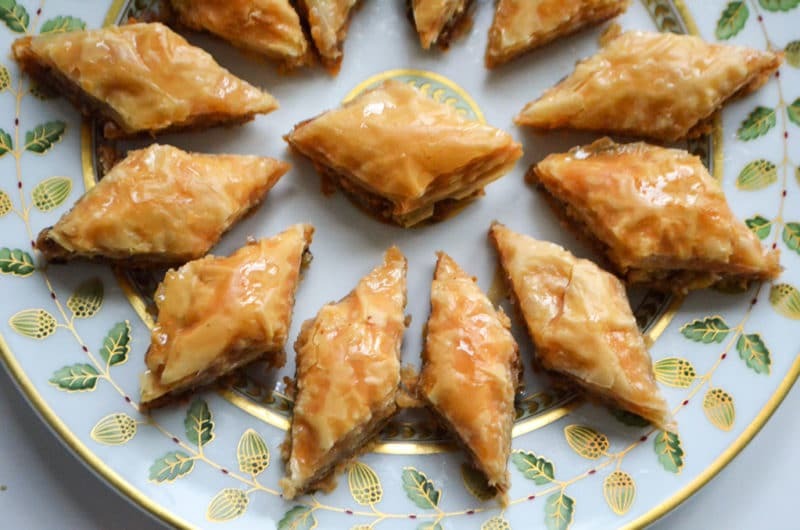 107 Responses to "Lebanese Baklawa Recipe. Do you hear what I hear?" Beautiful dish! I love the family connection. My late Sicilian Grandmother is often looking over my shoulder when I’m in the kitchen. Or so it feels. Ohhh, I bet she was a wonderful cook! Joy to you and your family at Christmas, Maureen! Baklawa is important in our Italian family, too. We LOVE the flavor-texture combo! Also, during my pregnancy with daughter Deanna, I craved baklawa. Turns out that Deanna is a lovely, sweet girl, now 43 years. Was it the baklawa that sweetens her personality and her life?? The baklawa may have played a role but I suspect most of her sweetness comes from her mama. Merry Christmas, my Antonia! Yum yum yum … looks amazing. Just the way I like it. I’m surprised you make what we call the “restaurant” version with all of the filling in the middle. We always thought this was done to save labor but a poor substitute for the real thing. In our version it takes three people: one for sugared nuts; one for phyllo; and one for butter. We put down 5 phyllo painting butter on each one then put on a scoop of the nuts, followed by phyllo, paint the phyllo with butter, another scoop of nuts (make sure they’re even over the pan), another phyllo painted with butter, another scoop of nuts (pace out the nuts to keep them even)………etc. until there are 5 phyllo left they go on the top one at a time with each painted with butter. Any extra butter is poured on top. This gives a better combining of the flavors than with all of the filling in the middle and the syrup goes through the whole thing with the nuts making spaces. This is fascinating Roger! Baklawa is not made, among my people, the way you describe…but I’d love to try it! Sounds like the nut layers are very thin, and there are more of them. Delicious. Hi, I hope I wasn’t insulting of your tradition. Mix sugar, allspice, cinnamon, nutmeg, cloves and nuts. Melt butter is separate pan. Put together as in above post. Cut. Heat oven to 250. Place pan on top shelf. Bake 1 hr 30 min or until brown on top. If it doesn’t brown, broil for a very short time (just a few seconds to brown, not burn). My syrup recipe is a little different, probably because rose and orange water weren’t available. 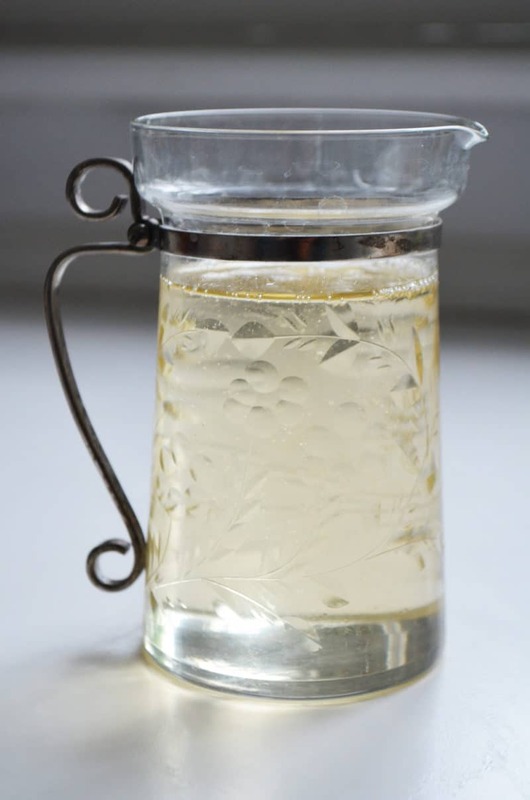 Put all but honey in pan and heat on moderate stirring often until bubbles rise. Add honey and continue to cook until bubbles rise again. Remove and cool (but not cold, it needs to soak into the fillo). The thing is this can be done by one person but is easier with 3 as stated in previous post. Since this was only made during Lent it was something to look forward to each year. And I suppose there was more labor available in the winter since there weren’t outdoor activities. And I’m sure it was a “get together” for the ladies. Roger, it is great to have your comments and ideas shared here! Thank you for the recipe–the syrup is much different, and reminds me of Greek baklava flavors. I love that the baklawa is best made with three people…more fun too! Hi Karen! Thanks for your comment–the logs are really good. Let me know though if you try the method of pouring the butter and not buttering each sheet! Great to see you here. Hi Maureen! I finally garnered up enough nerve to try your method and recipe for baklawa and it is in the oven right now. Wish me luck. In the recipe ingredients for the nuts, it does not give an amount for the orange blossom water for the nuts. I added 2 t. and am hoping that was not too much. Also, I remember cinnamon as an ingredient for the nut mixture. Do you ever do that? I consulted other recipes and they are all different. Thank you for providing what I hope will be a special treat for my family. Merry Christmas! Hi Selene–I don’t add mazaher to the nuts, only the syrup. I like the nuts to be crunchy and the orange blossom water makes them wet. We have never used cinnamon in the baklawa, but as you say, there are many, many types and approaches! I loved reading about your Aunt Hilda’s logs. Do you have a photograph of them? Hello there, and thanks for loving the baklawa logs. They are so good! I don’t think I have a photo (a pity) but I promise that I will post about this method, with photos, in the not-too-distant future! Henna, thanks you! I’m so happy to know that you’ve been making my recipes and enjoying them–I will be thinking of you as you celebrate your son’s 2nd birthday with our wonderful baklawa! It was beyond delicious! Everyone totally loved it! I was lucky that I got a picture of it before everyone dug in, because there were only a few pieces left by the end. That’s great news, Henna, and how special! Love your photo and I’m so glad you are now a baklawa pro. I told Mama and she IS proud! Maureen ; While I love Orange Blossom water in just about everything (it works well in the date filling for Ma’moul), Baklawa MUST absolutely be made with Rose water and Rose water only! I suppose it depends on what we were given as children and what the family tradition was- (trying to be generous here but muttering darkly to myself!) Just kidding. I love your blog and it always encourages me to go ahead and make that special something that reminds me of my family. Though we always had either pistachio or walnut filling and always seemed to have a rose water based syrup made by the aunties and grandma, my grandmother’s hand written notes indicate the use of Mazaher or orange flower water. One of my fave Lebanese cookbooks by Sonia Uvezian, “Recipes and Remembrances from an Eastern Mediterranean Kitchen” says that either (or both) may be used- I may have to try some walnuts with orange flower flavoring. Maureen, I love reading about your baklawa. It reminds me of my Grandma’s which was the best on the east side of Detroit in the 50’s and 60’s. My Grandma made them in birds nests. What were the cookies called that were nut filled dough covered with syrup in the shape of “armadillos”? Donna, thanks so much. Are the dough cookies you’re thinking of fried? Maybe zalabia, but those aren’t filled with nuts typically. I so loved your Aunt Hilda! She was amazing. MAUREEN, YOU HAVE BROUGHT UP SO MANY WONDERFUL, DELISH MEMORIES. I, TOO AM INTERESTED IN THE ROLLED BUTLAWA, PUT IN TRAYS. IS THERE ANOTHER LAYER OF DOUGH ON TOP TO MAKE IT LOOKED UNIFIED?? Thank you Carol! The rolled version has the pastry intact from rolling–please email me to discuss more detail if you like! I was just looking at recipes and searching Lebanese recipes to see what was out there on Pintrest which led me to your site. You are the first person I have found on the Internet that makes Baklawa like my family!! I am teaching my 16 year old niece how to make it tomorrow! Wonderful! She is a lucky girl! My grandmother was from Zahle. She always used Rose Water in her syrup. I remember her making the phyllo dough by hand and stretching the sheets of dough over the couch until one day, commercially made dough could be bought in LA. She did call it baklawi (bit-LAY-wee), as you have mentioned. I will try the recipe on your site. Thanks for the tips. What an incredible thing, the way they made their own phyllo! Enjoy and let me know how you like the recipe! Maureen, I have now made two batches. For your readers: Follow the amounts exactly as you posted. Do not soft boil the syrup any longer than you suggested. My second batch came out perfectly…Yes, the cutting is the real pain, however, once the tray was baked, it looked just fine. Also, I think the placement on the rack is very important to even baking, along with the turning of the tray half way through. I did bake the tray for 65 minutes to get a bit browner, but ovens can differ. I mixed pistachio nuts with walnuts and this was a fun mix. Thank you, thank you for sharing the shortcut. The baklawi turned out perfectly the second time. I have now shared your recipe with many other friends. Thank you again! Happy New Year to you and your readers! Just made another tray for Valentine’s Day. I found that if I buttered between the last three-four layers, the cutting wasn’t so tedious because the layers stuck together better and didn’t lift so much! I also added dried cranberries, dates, and a little bit of crystalized ginger to the nut mixture and it was wonderfully mysterious to the pallet! Thanks again, I have now shown all of my children the shortcut you provided in this recipe and I hope the tradition will keep growing in our family. That’s just wonderful in every way! Thank you Teresa! What a beautiful article! My grandmother was Lebanese, and like your family’s our recipes have passed down through the hands of each generation. We also make bitlaywee at Christmastime. Each year, as my umie and I lay and paint the filo with butter (we’ll have to try your method), I feel my sithee with us still cooking. Thank you for sharing your family’s wonderful traditions! How special Jenny–thank you so much for sharing! I made a vegan version, and I modified it to use maple syrup. So it is a mix of Québec and Lebanon. The result is awesome. Thanks for sharing your recipe! Wow! Vegan baklawa! I’m so impressed! This was just PERFECT! It tasted like my mother in law’s, only…better! 😉 Her syrup is identical, and she also pours the butter on last as you do, after cutting of course. The only thing different was that she doesn’t toast the walnuts and I had to explain that added dimension as she questioned it, lol. I toast a lot of nuts for a lot of recipes, so I do appreciate that very much. YUM! My family was in heaven this morning! I have never made clarified butter before, and your instructions and tips were PERFECT and the whole process went off without a hitch. Ah yes, my mother and others in her circle are miffed about toasting the nuts…but we know it’s SO good that way! I’m thrilled you love this method as much as I do. Thanks for writing! So glad you are carrying the torch and passing on the BAKLAWA and oher traditions, Valerie! Thanks for taking time to write! I was so glad to find you. My father was syrian or some called lebanese. I love the food. I have learned how to fix several dishes. Our baklava used pecans and rose water. I love mamool too but have not found receipe like theirs. I remember they were gritty. I. Think they used cream of wheat. I have bought several books but none were close to our recipes. Yours are closer. Cant wait for your book..
Phyllis, thanks so much–my recipe for ma’moul is here–love to know if it is like you remember your family’s version! Hi Anna–you can use rosewater–but VERY little, just a few drops, then taste your syrup to see if it needs another drop. The rose should be very subtle (and do include the lemon). Let me know how you like it! I used a 1/4 tsp. of Rose water and it worked great! Thanks for such a great recipe. Pam, the orange blossom water is so crucial to the flavor here! Try this if you like, and if you want to substitute, you might try a little honey in the syrup, which is Greek-style flavoring. OH MY GOODNESS!!!!! No buttering between layers?!?! This may be the very best thing since….anything. LOL. Every year when making this my mother tells me about learning from her Lebanese grandmother; rolling out the phyllo by hand and baking it in her wood burning oven. Every pan was definitely made with love. My great-grandma Bebe always used the rose water, which none of us really cared for much. Later, even to my great-grandma Bebe’s eye rolling, my mother started making it with either the orange or even vanilla. There is nothing like Christmas time and baking of Baklawa where neighbors, friends and especially the family members who did not learn the Lebanese cooking traditions, line up waiting for their own diamond. Thanks for sharing your recipe. I am so looking forward to trying this method. This is so great Jamie–I can’t wait for you to try this and taste how wonderfully this method works! my family also uses rose water and i am now on the hunt for it at my local ‘health food store…we, too, in massachusetts and maine say, ‘baklawee’! my relatives from mosul in northern iraq made it differently. it is made with rose water, and importantly, ground cardamom, which is essential to its character. the same walnut/cardamon/sugar/rosewater mix is used in another confection i don’t really know how to spell but is pronounced CLAY-che. these are like small sweet dumplings where the nut mixture is wrap in dough, wrapped and brushed with egg white and baked under golden. cardamom is also essential in the king of iraqi confections called lozena, which doesn’t seem to exist outside of iraq. our family’s lozena was made with almonds ground to a flour, lots of egg white, sugar, cardamon and a touch of rose water. it is baked in a medium-slow oven until golden brown. when cooled it is chewy on the outside and more yielding on the inside. in my view it is among the finest confections in the world, but few people know how to make it or even know about it. anyone who likes baklawa would adore lozena. Wow, this is so interesting! The Iraqui lozena sounds divine and I would love to make it! So thrilled to come across your site. Thank you SO much! We called it ba-LAY-wa growing up, but I love the idea of my little bitLAYwee. My sister taught me our grandmother’s recipe (our family is from Saidnaya, Syria, and from Zahle, Lebanon, and I believe she used either orange blossom water or rose water. If I couldn’t find in the store, I have used orange extract as a substitute. I have never tried the shortcut you mention, wow can’t wait! Thank you again for a wonderful post and opportunity for others to share ! So beautiful! Kristin, how sweet and wonderful! Thanks so much and I hope you enjoy this simple baklawa method as much as I do! I’m great fonder of these Lebanese recipe…Last time thought of making Baklawa and somehow derived at your site……All your recipes seems awesome………Will bookmark your site for future reference.Keep so share more! I made your recipe and it came out great, like the middle eastern bakery I go to. The problem I had was the that the baklava layers came apart (after baking and adding the syrup). Did I needed to put butter every layer? What could be the mistake. Thanks. Hi Tami–with the diamonds, whether you butter all of the layers or not, they tend to want to come apart a bit (but not entirely) when you cut them. It can help to press down on the nut layer and then on the top half of the phyllo stack before buttering. We serve these in little cups, which holds the diamonds together and makes them easier to eat. OMG Maureen!!! I made these today and your recipe is SPOT ON! Thank you so much – I was super worried about using too much mazaher but it was perfect. I’ve never made baklewi before – this recipe is super easy! In my grandma’s hand written cook book, we got instructions like add water to texture. On the back of on page it did say “buy phyllo dough on the corner of 300 S and 300 East in their freezer section”. So we don’t have exact measurement on practically anything, 15 lbs of flour, 1/2 a box cream of wheat, orange blossom water to taste. However we have the exact location of purchasing phyllo dough spelled out to the freezer section. Funny that store does not exist anymore and we are fortunate we can buy it at the grocery store. My mom tells stories of stretching dough over the beds. It sounds as though we are related! Oh my!! This is precious! Thank you cousin Terri! What a memory your mom has of stretching the dough over the beds. Just perfect!! 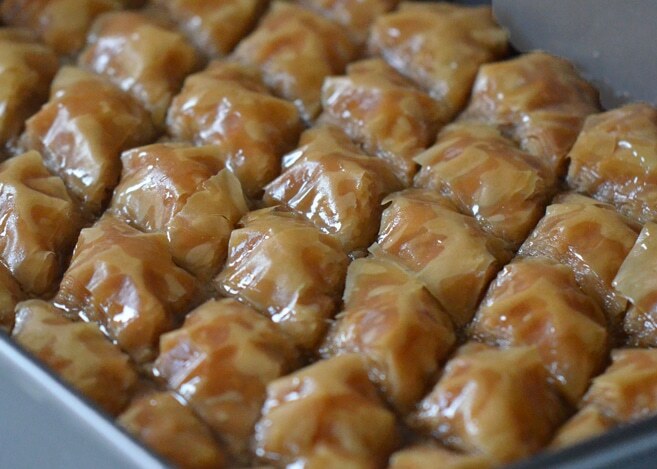 Thank you for the Baklawa recipe and all your answers to different questions. it is helpful to read your answer to Tami, as I have had trouble with the top layer (on top of the nut mixture) falling apart too. I do add some rose water to the nut filling. Do you think this causes the top layer to fall? I have also tried to spread some butter on the layer that touches the nuts. I will appreciate your opinion, please. Hi Fadia–I don’t think your flower water in the nuts is making the top fall apart. I wonder if your phyllo dough is fresh enough. Sometimes the dough, if it’s older and dried out, will crack and fall apart no matter what you do to help it along. Hi Maureen, thanks for taking time to answer. Yes, that is a good point. I keep the phyllo in the freezer for several months, for sure it is not very fresh when I use it. You are right! Thanks again. I am so happy I found this blog and this recipe. This is just exactly how my Mother-in-law made this and it was passed down from my Father-in-law’s mother. So thank you.. I have all the ingredients including the Orange Blossom Water.. so important! My son is coming home and this is one of his favorites from his special Sito. Thank you so much. How special Grace, thank you. Hi Maureen, I read one of the comments, Rogers, and have to agree with you, apart from the pecans and alspice, his recipe sound Greek to me .. I was interested in your variation ,i.e., putting all of butter when you finish layering baklava ..is it crispy this way. Also the orange blossom, I love this, and I will be using Cypriot orange blossom, which is aromatic and subtle ..thanks for your recipe.. it looks great ..
Fun to read all the comments and I have learned a few tricks for improvement. Thanks everyone! I have found that it is easier to cut BEFORE putting butter on top. I’m so thankful for this recipe! I feel so intimidated by the buttering of each layer, so I never made it. You’re recipe is just like my grandma’s, except for the technique. I’m getting ready to put it in the oven. I missed one step, and it explains some of my frustration with cutting the pieces. I forgot to brush the top with butter before cutting so it dried quickly. I hope it will still be okay. I’m so proud of myself! Hoping to bless my family this Christmas, since grandma isn’t able to bake any longer. Next up, meat pies! I love the short cut method. I was teaching my niece and we had a lot of fun together, buttering each layer is a pain. My first shortcut version is in the oven now and smells amazing. My husband is your cousin, an Abowd grandson and I have learned a lot of great recipes from the Sittos and yours are exactly alike. Thank you for sharing your extensive knowledge. I just ordered a couple of cookbooks as gifts. How special Sherry cousin! My love to your husband too! 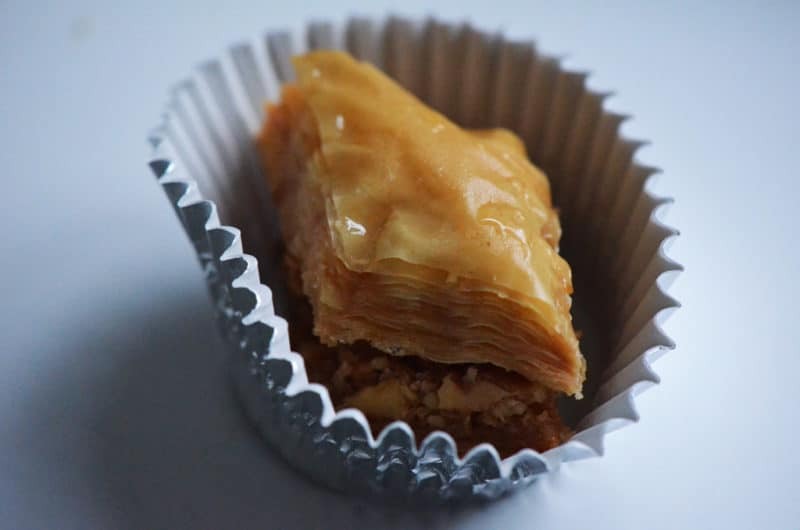 I plan my first attempt at Baklawa using your method tomorrow and if it turns out as nicely as yours looked on your instructional video I am going to make a second batch to take to Christmas dinner! Thank you so much for sharing this short cut version. Both batches turned out beautifully and were delicious. I just need to practice on cutting into diamond shapes! I wanted to point out a few differences between the printed PDF recipe and the video. The recipe instructions call for brushing the bottom of the pan and top layer with butter but that wasn’t done in the video. (It states this in your cookbook too). I tried it both ways and found it better to do as shown in the video. Brushing the top layer sure made it even more difficult (at least for me) to cut. Also, the instructions in the PDF version of the recipe on your website states to combine the walnuts, sugar and mazaher even though the mazaher does not appear in the filling ingredients. I know you do not include it in your filling and thought you would like to know. Again, thank you. I have so enjoyed reading your stories and making so many of your recipes. Happy Holidays! Getting ready to assemble the baklava. I use to butter each sheet, like my Greek yiayia taught me. What a pain! From now on, I’m going Lebanese. 20 bottom, nuts, 20 top. Cut, butter, bake. Doesn’t get any easier. Thank you. I need to make a lot of baklava for a wedding. So I bought a 12x18x2 pan and my phyllo dough is 12×14 . So my question is how much nuts to use and do I use one pkg for bottom and one for top. I know that I will have to add 4″more to fill the pan for top and bottom. Wow! I think you’re saying you have one package of dough that has two sleeves of phyllo in it; if so you’ll want two sleeves for the bottom and two for the top of this smaller size, since these are cut too small for your pan, and you’ll want to overlap or stagger them to fit and that will take more than one sleeve. I’d increase the filling to 5 cups, but hold back when you spread it over the phyllo to get a feel for how much you’ll need. I don’t like too much filling because it makes the diamonds more difficult to handle. Lucky couple! For those suggesting to add honey/cinnamon–Stop it. Maureen has been so very kind; I’ll be my honest Lebanese self. Be2lewa or Baklawa is done as described in the recipe Maureen shared. If you add honey to it, it becomes something else. “NOT RIGHT!” That might be your tradition (Greek, etc.) but NOT Lebanese and hence “Not Right!” BTW, my ant and cousins are ‘Nicolaous’ -obviously a Greek last name, and I love Greeks. You are wonderful!!!!!! Thank you!!!! 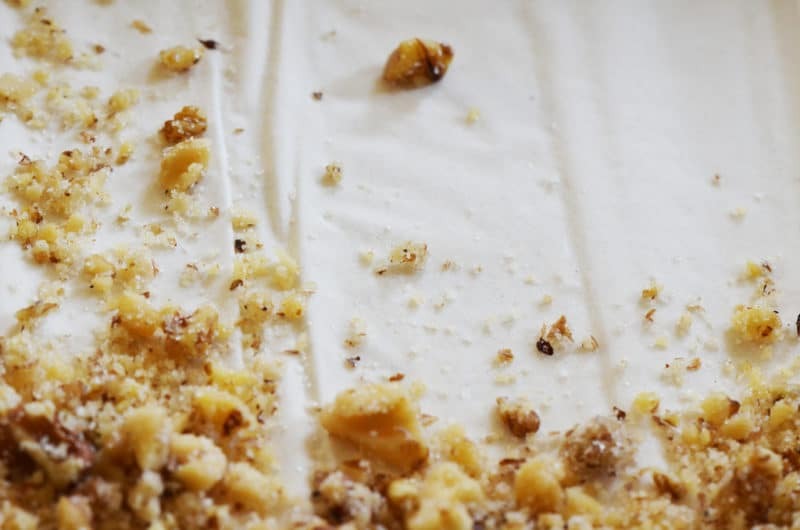 Hi – Do you think that your version makes the layers a little more dense or the nuts a bit more greasy if all the butter has to go through them to get to the bottom? We always make the diamond shape with one layer of nuts in the middle (aka, by one commenter, “the restaurant version”), but we butter in between each phyllo layer. Hi Jo–baklawa is traditionally made by buttering each layer as you do, but this method that my aunt used and that I now use works beautifully. The nuts stay beautiful. She, and then I, found that leaving the flower water out of the nuts and using it just in the syrup made a difference in keeping the nuts from softening. Try it! I think you’ll be amazed at how wonderfully this method works! For a long time I wanted to make baclava/baklawa myself. I am born Romanian (now living in Canada) and my mother and her generation have used a different recipe, perhaps turkish or greek, passed down through spoken word – which I think – has lost some of the details which you expose in your recipe. I love the stories around your family’s baklawa cooking that you shared with us. Yesterday, December 30th, 2017, I followed your instruction and made baklawa by myself for the first time ever and it is amazing. The little details count. It is so easy to make nowadays that I will probably make it every month and binge on it! Dan, this is so special! Thanks a million for all of your kind words. I’m thrilled you love this recipe as much as we do. Right Kelly!!! You’ve gotta go for it! Was your aunt Hilda from Lansing? My husband believes she was his cousin. I will try your method soon. Hi Sandy–yes! Aunt Hilda Abood from Lansing! Sounds like your husband and I may be related…. Thanks for all your wonderful recipes. I butter every other sheet of phyllo and add a tsp of cinnamon to my nut mixture. I find making Baklawa very relaxing as I just take my time. I always have used Rose water ,but I think I am going to try the orange blossom next time. I make a large pan at Christmas for my friend’s Christmas party . They are Italian and it is always a big hit with their family. I have had many of them ask for the recipe. That is wonderful Susan! Our Italian neighbors also LIVE for the baklawa. We are all cousins aren’t we?! Thank you for sharing! I have made this recipe several times and it works magically well. Question, If I wanted to make this as a savory pie (spinach), same method with same quantities of butter? So happy to hear that Maria! As for the spinach pie, you wouldn’t typically cut the phyllo until after baking, whereas this method relies on the phyllo cuts before baking in order for the butter to seep down through all of the layers. Even if you did cut the savory pie first and pour the butter over all, the filling may be less forgiving in terms of allowing the butter through, as it will be much thicker and heavier than nuts. Hmmm. If you do try it please let us know! I would use the same amount of butter as for baklawa, if not a little less. Do you have Baklawa with cream instead of nuts? Great suggestion Anthony–that’s a recipe I’d love to develop! Typically the cream filling is used with kataifi dough (shredded phyllo) rather than as baklawa. Is that you’re experience or have you had the baklawa with a cream filling? Hi – I was watching Martha Bakes today and a Greek baker was describing how her family hand stretches their phyllo dough. It reminded me of how my Lebanese grandmother made her own phyllo dough for something we called Meh-heh-lee. My grandmother used rose water as a flavoring which Martha did not. My question is about what you call the Lebanese version. Are you aware of a different name other than Baklava? I am going to try making a version (it has been over 20 years since I have made them). I so so so appreciate the original recipe and all the comments of those who shared their variations. It gives me more options and I enjoy learning about the different family takes on an internationally loved dessert! Wonderful, thank you so much and enjoy! Oh, I can’t WAIT to make this, the way your Aunt Rita did! I’ve only made baklava once, the time consuming way, & vowed never again. But then I came across your video how-to on YouTube & was quite intrigued! I even bought some of your orange blossom water just now! Thank you for making your baklawa look so easy! Hi Kristin!! Thank you so much and I know you’re going to enjoy this baklawa as much as we do. So much fun to make it and absolutely delectable to eat! My mother and grandmother (TaTa) make the Syrian version and usually do the rolled version— which seems easier to make. My mom just made a bunch for Christmas— so good! !